When constructed improperly, homeowners often find themselves with retaining walls that lean. Most of the retaining walls throughout the state consist of concrete block masonry. The remaining are dominated by brick or rubble stone masonry walls, solid poured concrete and segmental concrete block. 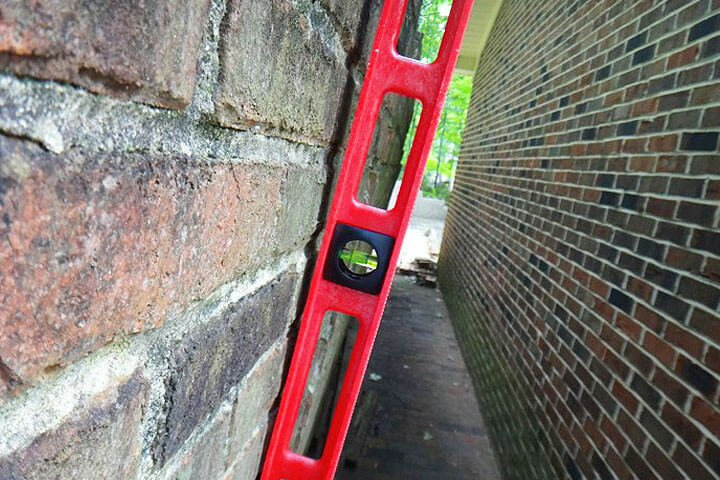 The most critical (dangerous) retaining walls are those over four feet tall. At this height, the lateral forces behind the wall become substantial and hollow-core concrete block has a difficult time resisting these lateral forces. The end result of an improperly constructed wall is gradual, forward tilting, followed by eventual collapse. The latter normally occurs during rainfall. Most of the leaning retaining walls we see are the ever popular, concrete block retaining wall. This wall generally consists of either 8-inch or 12-inch thick (wide) concrete block, laid in full-head and bed mortar joints, resting on some sort of continuous, poured-concrete, footing. If the wall is of hollow core construction, then it is severely limited with regard to long term performance for wall/backfill heights exceeding three or four feet. If the wall is filled with concrete and reinforced with steel, it is still severely limited if it is not connected (tied) to the supporting concrete footing. This can only be accomplished by using properly-sized, steel rebar dowels securely embedded in both the footing and the wall. Even if the wall is tied to the footing with steel dowels, the wall is still worthless for backfill heights exceeding about five feet, if the concrete footing is only made about two feet wide. And there’s the rub. Based on our experience, most leaning retaining walls, no matter how tall, are usually constructed on two-feet wide footings. We’ve concluded that builder’s apparently consider this “standard foundation footing width” also adequate for retaining wall construction. Unfortunately, it’s not. The reason why these improperly constructed retaining walls are so lousy is that their dead weight, which can be modeled as a force vector pointing down, toward the center of the earth, acting through the wall’s center of gravity, cannot counteract or resist the horizontal force vector exerted by the earth backfill (soil pressure) on the wall, when both vectors try to rotate about the outer (front) edge of the footing. The lateral force vector dominates, especially when the backfill soil is a native clay which has a tendency to retain water. Hence, these walls cannot act like “gravity-type” retaining walls. They are not “massive” enough. If the block wall is left hollow, it simply breaks or separates along the base (bottom) mortar joint and topples or slides forward-often in a catastrophic fashion. Drainage conditions also play a large role in success or failure of a retaining wall. If water is allowed to collect behind the wall, the horizontal forces increase substantially. Poor drainage conditions are usually the reason most wall failures occur during rainfall. Drainage is improved by backfilling the wall with gravel/sand, installation of a foundation drain, proper terrain, etc. If properly constructed, however, relatively “thin” (8- to 12-inches thick) concrete block retaining walls are capable of resisting lateral pressure. These walls are called “cantilever retaining walls”. The name implies that the vertical wall segment “cantilevers” out of the footing. In other words, the base of the wall is rigidly attached/connected to the footing. Well it’s simple: you build a properly sized and reinforced footing and stem-wall, and rigidly connect the two! The former will usually have a footing width equal to about 60 to 75 percent of the wall height. Hence, a six foot wall may require a 4-1/2 foot wide footing; an 8-foot tall wall may require a 6-foot wide footing, and a 10-foot wall may require a 7-1/2 foot wide footing, etc. The actual size of the wall and footing should be determined by an engineering analysis which takes into account: the bearing capacity and shear strength of the supporting (underlying) soil; the strength properties of the wall and footing; the type and height and slope of the soil backfill that will be placed behind the wall; and, the drainage conditions that will exist behind the wall. In cantilever retaining wall construction, most of the footing width is actually extended back behind the wall, beneath the backfill. The dead weight of the backfill, acting down on this footing “heel” is what gives the “cantilever retaining wall” its “stability”. In other words, for the wall to tilt forward, the footing must be pulled up through the backfill soil. If you know of a fairly tall (more than 4 or 5 feet) concrete block retaining wall, that is leaning, have it inspected by an engineer. Since a properly designed/constructed wall shouldn’t tilt or lean forward, an engineer must determine whether the existing wall is safe and/or if it can be salvaged. Typical enhancements might consist of converting an existing masonry wall into a “gravity wall”; installing tie-backs or dead men anchors that extend back into the natural embankment; or constructing closely-spaced, buttresses against the wall. In some cases, where money is limited, it might be prudent to simply remove the wall and consult with a soil scientist or geotechnical engineer on how to construct a stable, exposed (sloped), soil embankment. For those wanting to read more about the three different types of retaining walls, the National Concrete Masonry Association (NCMA) has published a series of articles, TEK Notes numbers 15-8 (Stock 91), 15-7A (Stock 97), and 15-6 (Stock 96), each costing $ 1.00. These explain the proper construction procedures and design principals for cantilever, gravity and segmental retaining walls. You can contact the NCMA and order the articles by telephone (703-713-1900) or by visiting their website at www.ncma.org.